A far left-wing South Korean political party could be banned from contesting elections for its pro-North Korean stance in a move critics say smacks of President Park Geun-hye’s father’s suppression of democracy during his long stay in power. The Unified Progressive Party (UPP), which holds six seats in parliament and has contested presidential elections, is widely seen as supporting the reclusive North’s political aims. The two Koreas remain technically at war since the 1950-53 conflict ended in a truce rather than a peace treaty. North Korea conducted its third nuclear test this year in defiance of UN resolutions and has threatened the South and its major ally, the United States, with nuclear destruction. 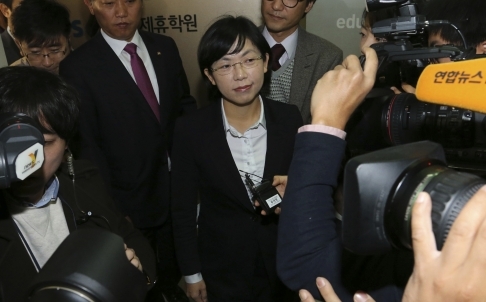 Justice Minister Hwang Kyo-ahn said a request to disband the UPP would be submitted to the Constitutional Court. “We have concluded that the principles and objectives of the United Progressive Party are in line with North Korean-style socialism, which goes against the basic rules of free democracy,” Hwang told a news conference on Tuesday. He said prosecutors had alleged that senior UPP members had plotted to “stage revolutions” against the Seoul government. It was not clear whether Park, who is on a tour of Europe, had endorsed the move. But last year, she described the views of two of its lawmakers as “dubious” and said they should not be allowed to serve in parliament. The party secures about 1 per cent of the popular vote in nationwide elections and small demonstrations calling for rapid reunification with the North are a regular feature in Seoul. Parties deemed openly hostile to the South Korean political system are banned, unauthorised travel to North Korea is prohibited and possession of North Korean publications is strictly controlled. But the main opposition Democratic United Party party denounced the move to ban the UPP as a threat to the South’s democracy, which has been developing since the late 1980s. “It is very regrettable that this unfortunate incident is happening for the first time in the history of our constitution,” a party spokesman told a briefing. The Ministry of Justice launched an investigation into the UPP following a petition filed last year by an alliance of around 30 right-wing groups calling for a ban on the party. “This party fundamentally opposes the Republic of (South) Korea, and should be separate from (the concept of) political freedom,” said Park Jung-soo, an activist heading the alliance. Park’s father, Park Chung-hee, led South Korea from 1961 until his assassination in 1979, a tenure marked by human rights abuses and the imposition of martial law, but also by policies sowing the seeds for rapid economic growth. UPP leader Lee Jung-hee caused controversy for referring to Park Chung-hee by the name he used while serving as an officer in the Japanese Imperial Army when the Korean peninsula was under Japanese colonial rule. The party has likened the current president to her father, using terminology that often echoes North Korean rhetoric.